© 2002, © 2016 by Paul Freeman. Revised 1/24/16. A 1946 aerial view looking northwest at TCU Airport (courtesy of Jerrell Baley). Note the plane in flight over the runway intersection. 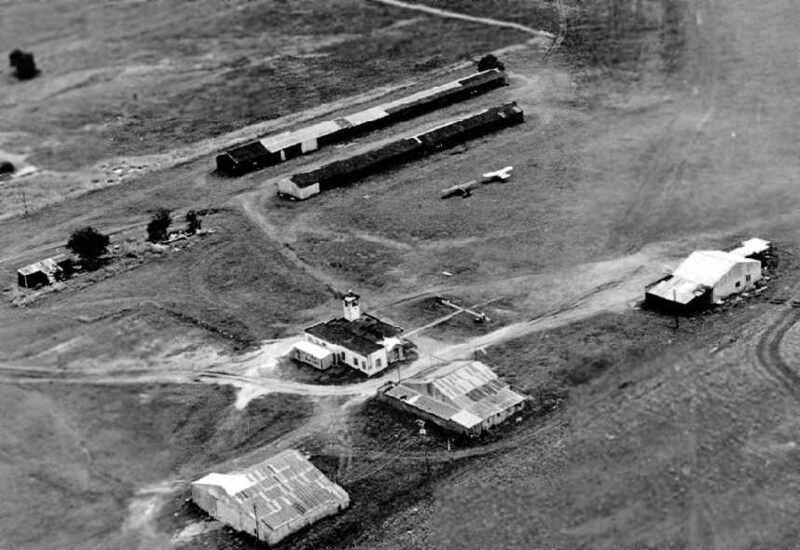 This short-lived airfield was operated by Texas Christian University (located a few miles to the northeast). 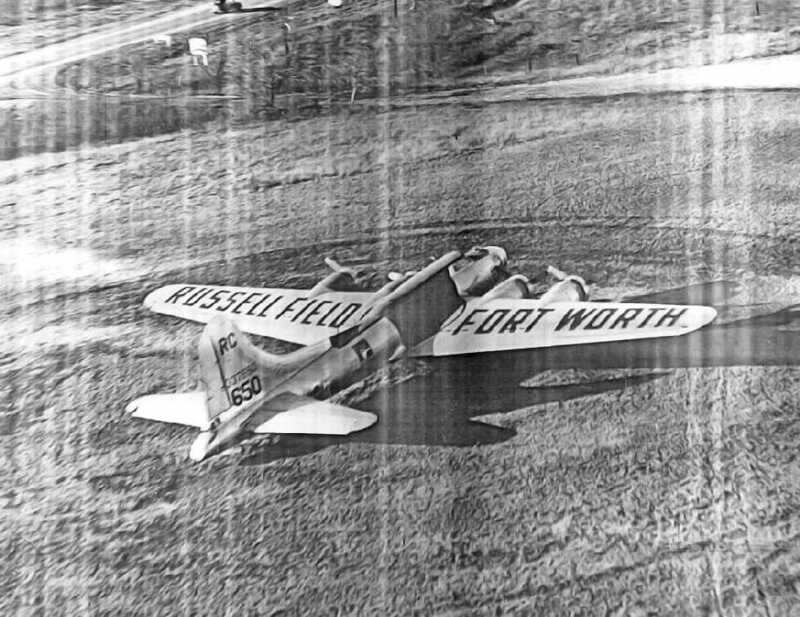 “My first flight at TCU Airport was 6/2/46. I received my Private Pilot License 8/24/46. My instructor was Howard Hale. One [logbook] entry leads me to believe B. M. Roberts was the airport owner. 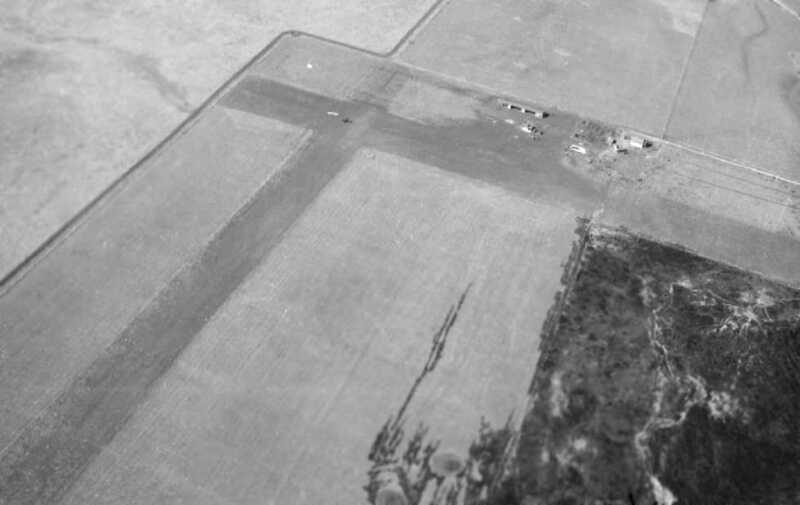 The earliest depiction of TCU Airfield which has been located was a 1946 aerial view (courtesy of Jerrell Baley). It depicted TCU as having 2 perpendicular grass runways, with a few small buildings northeast of the runway intersection. The photo showed a single plane in flight right over the runway intersection. 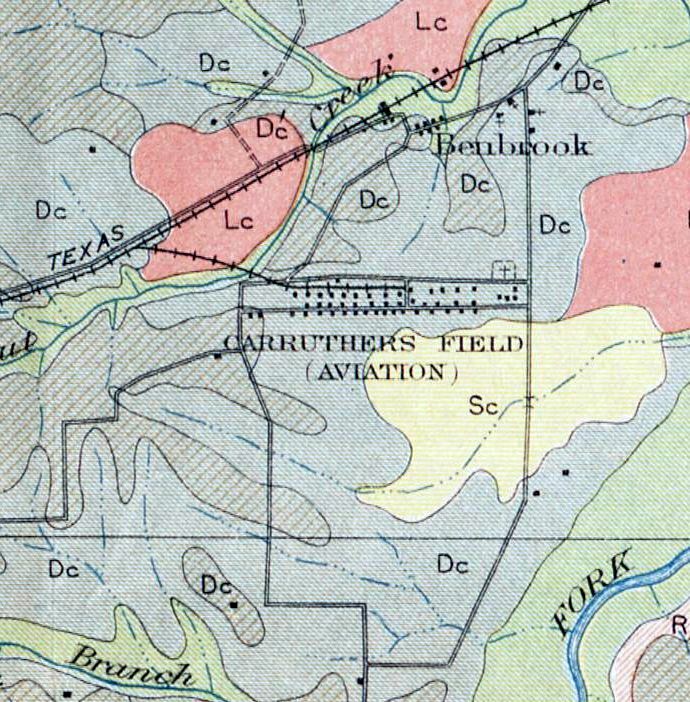 depicted the "TCU Airfield" as an irregularly-shaped area, bounded by the railroad tracks on the southeast side. No runways or buildings were depicted at the field. where flight training took place for students in the ROTC at TCU." Ganey Bradfield reported, “I live directly across the railroad track from the obtuse angle in the southeast airport boundary. I have lived at this location since 1951. An undated advertisement for flight training at TCU Airport (courtesy of Tom Williams). 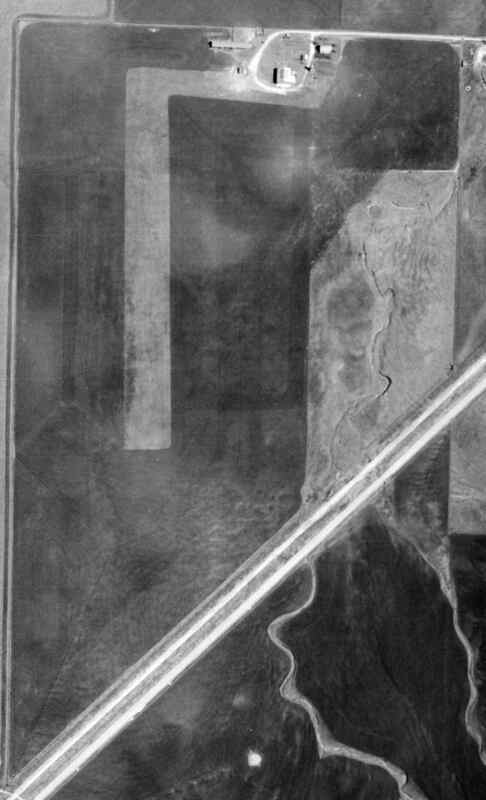 A 4/1/52 USGS aerial view showed TCU Airport as having 2 unpaved runways, with several small buildings on the northeast side. Ganey Bradfield recalled, “I remember flying off the airport in the late 1950s. 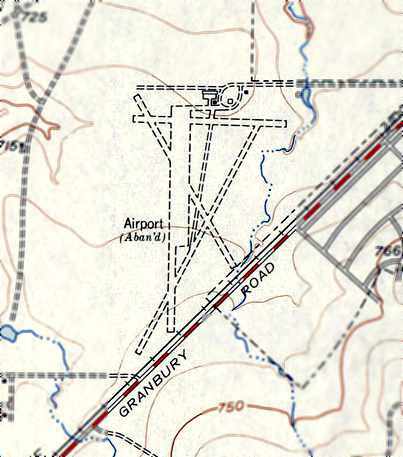 The TCU Airport must have closed within 1955, as the 1955 USGS topo map (courtesy of Ganey Bradfield) depicted it as “Airport (Abandoned)”. It still depicted 3 runways, multiple taxiways, a ramp, and 2 small buildings. 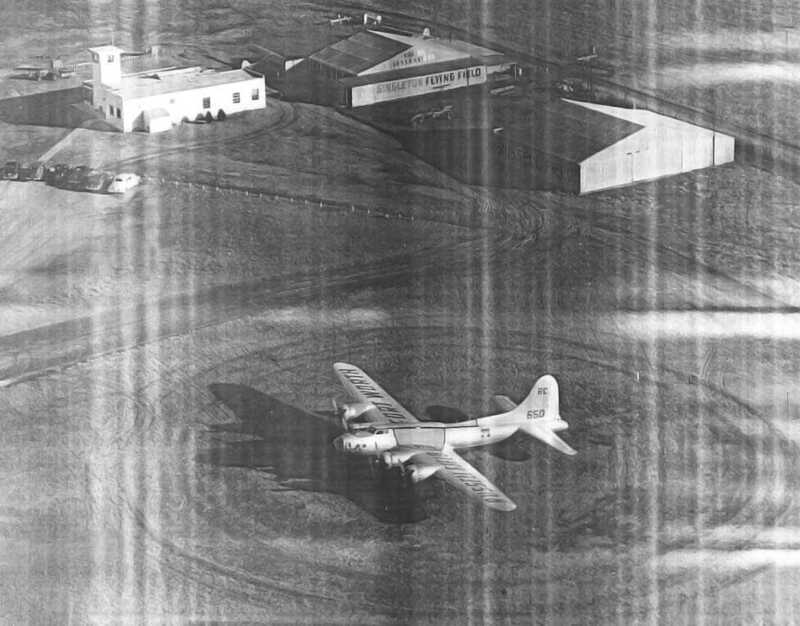 A 1956 aerial photo evidently depicted TCU Airfield after it had been abandoned. but there were no planes or other signs of recent aviation usage. 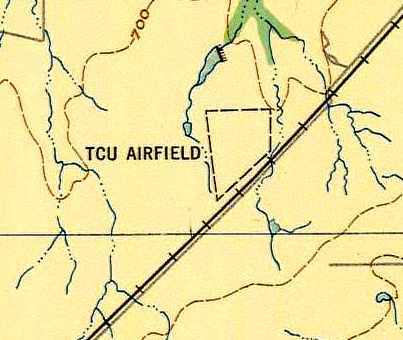 The TCU Airfield was no longer depicted at all on the 1957 DFW Sectional Chart (courtesy of Chris Kennedy). 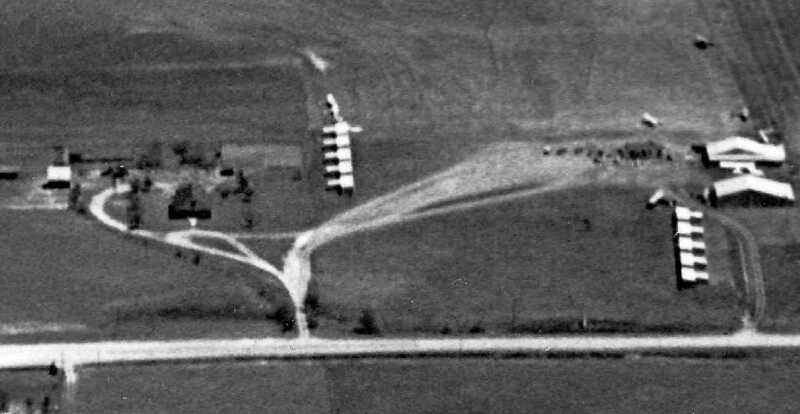 A 1959 aerial view looking north (courtesy of Jerrell Baley) showed that a housing development had covered the site of TCU Airport. 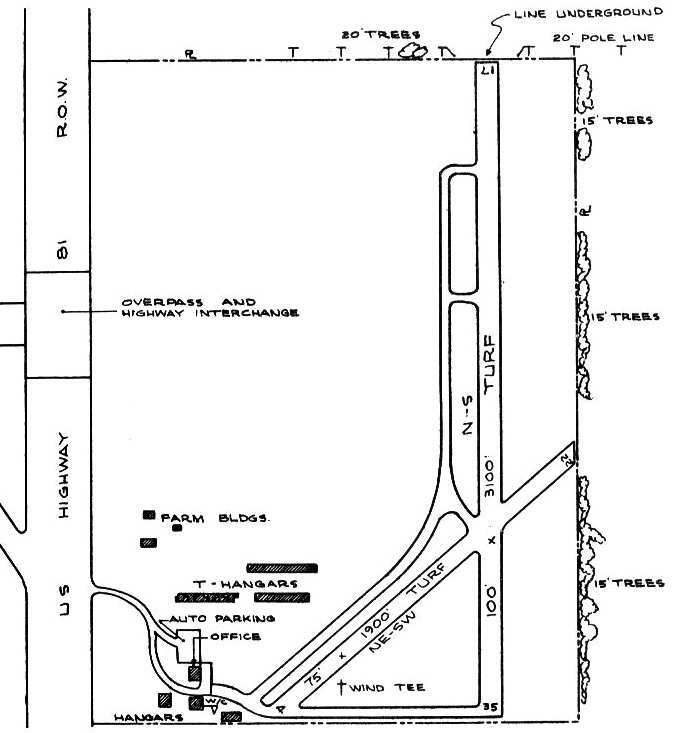 The location & layout of the former TCU Airport, superimposed by Ganey Bradfield on a 1963 TX Highway Department map. Ganey Bradfield recalled, “In 1963, the Westwood Addition to Fort Worth had been developed. 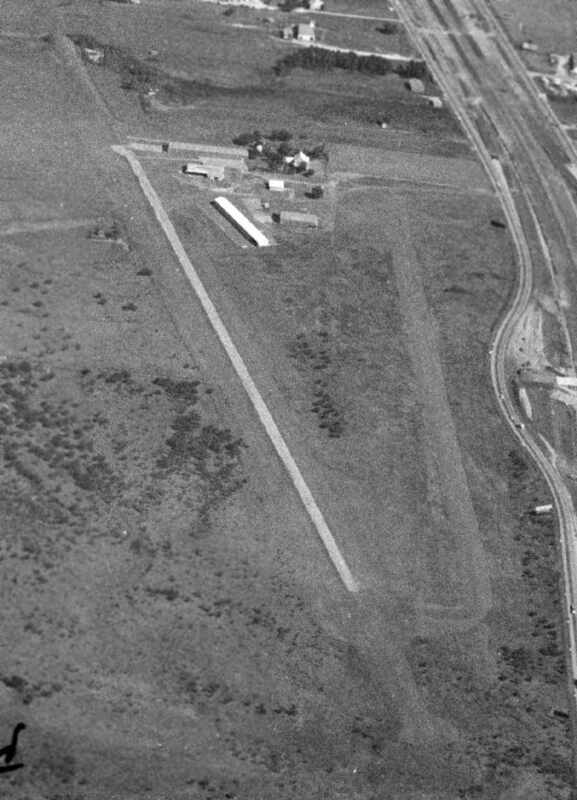 There was no trace remaining evident of the former TCU Airport on a 1970 aerial photo. 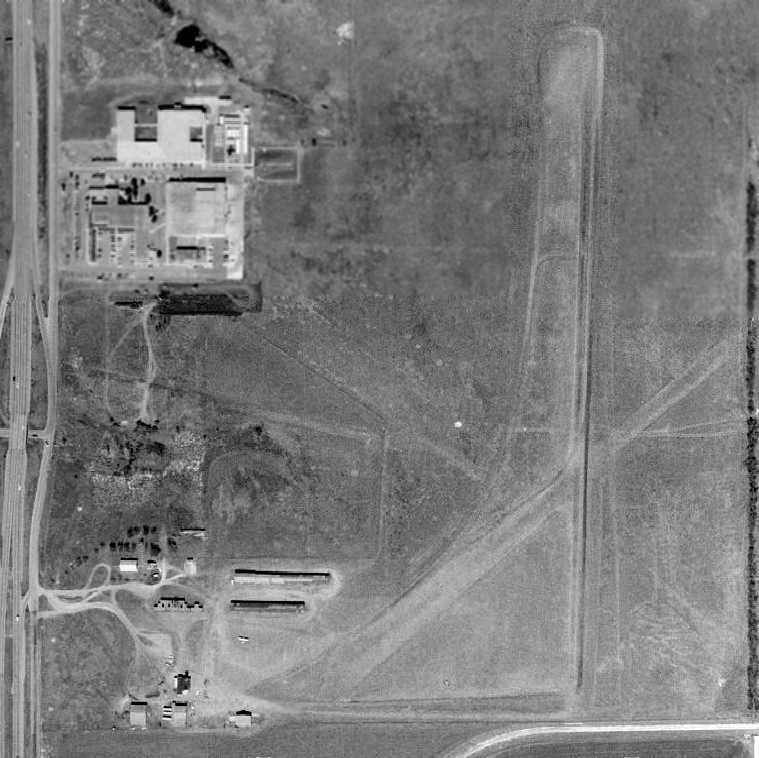 As seen in the 2001 USGS aerial photo, not a trace remains of the former TCU Airport. 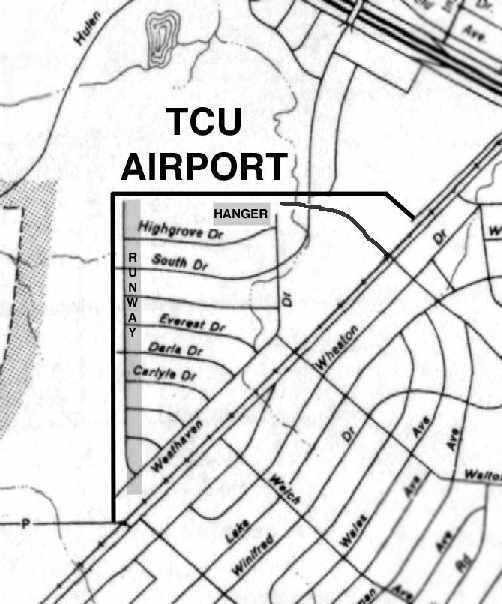 The site of TCU Airfield is located northwest of the intersection of Wedgemont Circle North & Granbury Road. 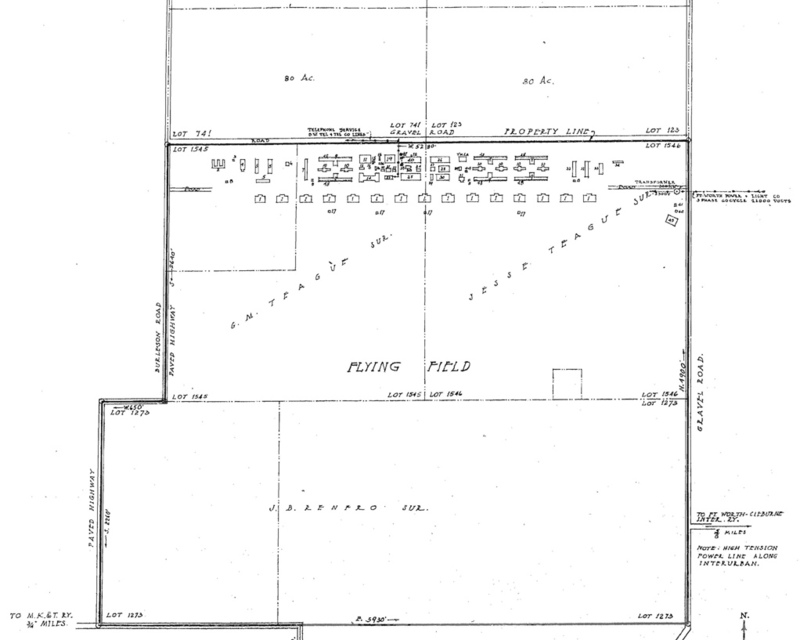 Singleton Field, as depicted on the February 1942 Dallas Sectional Chart (courtesy of Chris Kennedy). as it was not listed among active airfields in the Airport Directory Company's 1937 Airports Directory (courtesy of Bob Rambo). was on the February 1942 Dallas Sectional Chart (courtesy of Chris Kennedy). was labeled "proposed field (Singleton) for NAS Dallas." It depicted Singleton Flying Field as an L-shaped grass area with several hangars at the southeast end. showed 2 hangars & 10 individual T-hangars, along with at least 6 aircraft. the Navy requested the use of the airfield [Singleton Field] for training purposes. when the Navy leased 130 acres from J. R. (Bob) Singleton for $2,000 per year. depicted “Singleton Flying Field” as an L-shaped grass area. Brian Rehwinkel reported, “A 12/30/43 'Outlying Field Report' describes describes the field surface & runways as being sod. described Singleton Field as having a 2,400' unpaved runway. as a 124 acre rectangular property within which were 4 graded runways, the longest being the 2,250' north/south strip. The field was said to have 2 wood & metal hangars, measuring 60' x 54' & 54' x 46'. Singleton was said to be owned & operated by private interests, but also to be used by the Navy. Brian Rehwinkel reported, “Singleton Field was leased by the Navy through the end of the war. indicated Singleton OLF would become excess to the Navy's needs on 4/1/46. According to Don Newton, Buck Russell's “first airport manager was Stoney Henry, my Grandfather. It was the first airfield I flew out of. Charley Wilkerson who owned Sycamore Field was the airport manager / A&P mechanic and flight instructor for years. He was a real man's pilot; he used to slap me in the back of the head from the back if you didn't keep the ball centered or string line centered. My Mom Barbara Jean Henry flew out of that field in the 1945 area. Bernie Masyga recalled, “I remember Russell Field very well as I got my Private Pilot License there in 1946. The aircraft we flew then were J-3 Cubs & Funk Bs. There were a number of instructors at that time - all ex Air Force men being right after the war. There was a man we knew as 'Stoney' Henry who I think was the manager of the field at that time. I remember he tried to sell me an old Porterfield (40 hp), but I didn't have any money. There was an East /West runway that crossed the main runway about midfield. An undated (post-WW2) aerial view looking southwest at a surplus B-17G Flying Fortress bomber (43-37650) which was used for promotional purposes at Russell Field. Note the hangar which was still painted with “Singleton Flying Field”. An undated (post-WW2) aerial view of a surplus B-17G Flying Fortress bomber (43-37650) which was used for promotional purposes at Russell Field. 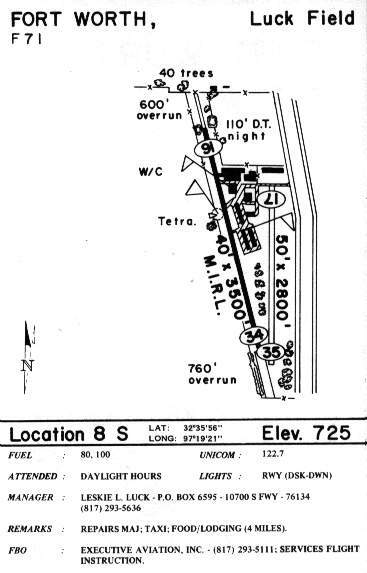 It was labeled as “Russell Airfield” on the March 1947 Dallas Sectional Chart (courtesy of Chris Kennedy). William Hooper's 1948 receipt for an hour of flying at Russell Field (courtesy of Daryl Pokladnik) showed a charge of only $6. According to Joel Russell, his father Tom Russell learned to fly & soloed at Russell Field in 1949. 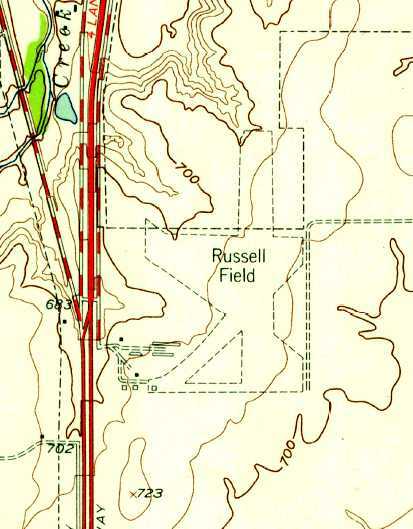 The earliest topo map depiction which has been located of Russell Field was on the 1955 USGS topo map. It depicted Russell Field as having several unpaved runways with a few small buildings at the southwest end. Al Pugsley recalled, “I flew off Russell Field on March 24, 1956.
and a friend & I started a flying school there. I worked for C.O. Thompson pumping gas & mowing the field. as well as a 4th unpaved runway, and several hangars & aircraft at the southwest side. depicted Russell Field as having a 3,100' unpaved runway. Tom Williams recalled, “My Dad was the owner of one of the flight schools at Russell Field from 1957-72. 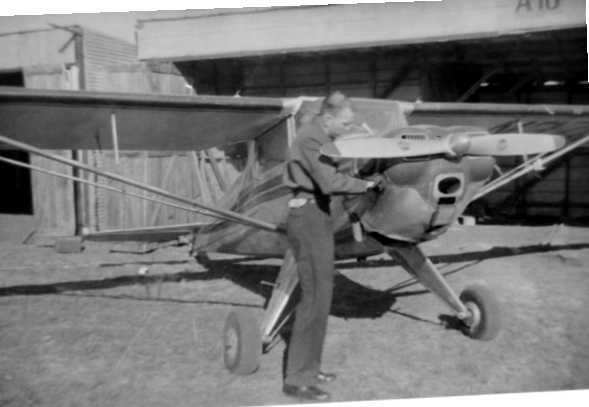 A 1958 photo of Tom Russell pre-flighting his Luscombe 8C at Russell Field (courtesy of Joel Russell). "In the 1950s & into the 1960s it was a very active general-aviation airport." Gerry Gieger recalled, "I do remember the Goodyear Blimp stopping at Russell field whenever it was in this area." Ganey Bradfield recalled, “Russell Field... I have flown off it several times. The BIG thing about it was a cliff on the north end that did a number on unsuspecting pilots landing to the south. would drop you down pretty low on final approach. A 1959 aerial view looking southwest at Russell Field (courtesy of Jerrell Baley). The runways & taxiways appeared to be paved in this photo, but all other information indicates the field always had grass runways. depicted Russell Field as having 2 turf runways: 3,100' Runway 17/35 & 1,900' Runway 4/22. which led to a group of six hangars & an office at the southwest corner of the field. Fulton Flying Service, Texair Flyers Inc., and Williams Flying Service. A 1964 aerial view by Ken Morris, looking northeast at Russell Field's hangars, taken from 'Hap's' Taylorcraft. Note the control tower on top of the building in the center. 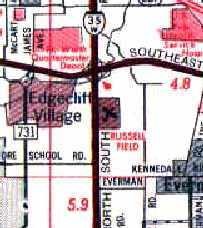 Russell Field, as depicted on the 1965 DFW Sectional Chart (courtesy of John Voss). 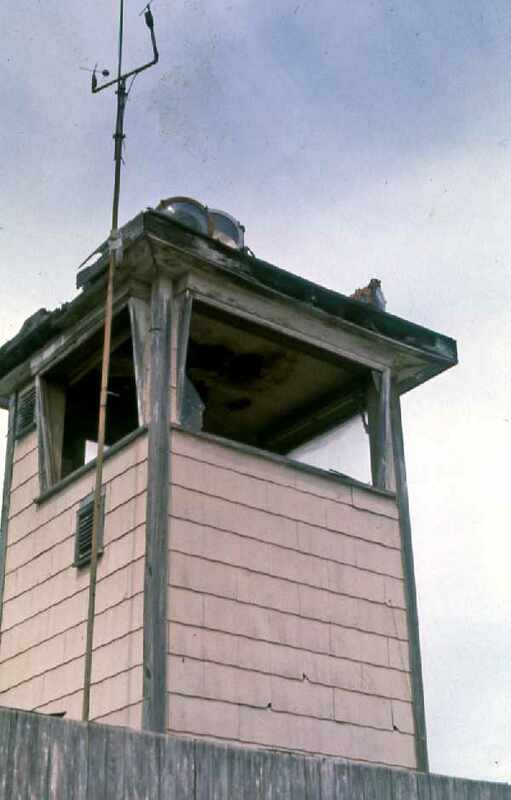 A circa 1964-69 photo by Ken Morris of Russell Field's control tower & hangars. which appeared to be abandoned by that point, with broken windows. Ken Morris recalled, “My 1st flying job was flying for 'Hap' Foster at Russell Field. C.O. Williams was the check pilot that gave me my commercial license. in the 1967 TX Airport Directory (courtesy of Brad Stanford). A 1969 photo by Ken Morris of a Beechcraft Stagerwing in front of the Russell Field terminal building. my Dad would often take us to Russell Field to watch airplanes. they would usually moor the blimp at Russell Field. The entrance to Russell Field used to be south of where Alta Mesa Boulevard is now. The hangars were just to the south of the present day Holiday Inn. next to the I-35W service road. are roughly in line with the old flight path approaching the runway. The airport did not extend into the subdivision to the northeast. The subdivision was existing before Russell Field closed. [compared to what was depicted from the 1963 airport directory above]. seemed to be more in the middle [north/south wise] of the field rather than so far south." with evidence of a 3rd grass runway. but it did not appear very healthy, as only a single airplane was visible on the field. George Horn recalled, “My 1st assignment with S & S (which also operated S & S Patrol Field) was at Russell Field. I moved there & based a plane there for S&S in 1972. I flew Gulf Oil pipeline patrols out of there for over a year. he was usually rocking on the front porch of the old wooden terminal. A Mr. Foster actually ran the airport & he had a single-pilot 135 operation using an old Cessna 310 for freight mostly. Mr. Foster was good to me & gave me a key to his shop & allowed me to use his tools & shop whenever I wanted. and much to my surprise he took me up on the offer. I had to help him into the little airplane he was so frail. I recall he insisted on keeping his cane in his lap. as I had hired Ron Lane to replace me as the Fort Worth area pilot. It was shortly afterwards that I learned Mr. Foster had been killed flying freight (explosives for the government). I believe he hit a mountain somewhere. Just before I'd moved Mr. Foster had agreed to sell me a Grumman Wigeon with Rangers which sat in one of the shade hangars. It's engines were in crates, and the wings were also removed & crated & stored alongside as was the interior. The price we'd agreed upon was $500. He told me there was no hurry to pay him, as he knew I'd have to scrape to come up with it on patrol pilot's salary. and when I learned of his death, I returned to visit Mrs. Foster to pay her & pick up the logbooks. I was told the shade hangars had been bulldozed into a hole, complete with the airplane & crates of misc. spare parts. It's all under concrete now. 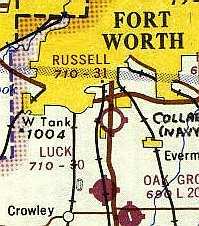 Russell Field was still depicted as an active airport on the 1974 Rand-McNally DFW road map. The last depiction which has been located of Russell Field was a 10/3/75 aerial view northeast (courtesy of Jerrell Baley). Three light aircraft were still visible on the field. Nancy Kelly recalled, “Ralph Hogue ran the flying school in 1976 – the control tower building was about the only thing left… and it was in pretty rough shape. as it was no longer depicted on the 1976 DFW Terminal Chart (courtesy of Jim Hackman). By the time of a 1979 aerial photo, the buildings & runways of Russell Field had been completely removed. Jeff Burns recalled, "I heard stories that the Miller brewery [to the south] bought the field to expand their facilities. the Miller Brewery built a building either on, or immediately off of the south end of the runway. Later the Holiday Inn came in, then Alcon expanded [several different times] & finally Alta Mesa was cut through." I stayed at the Holiday Inn in that general location which is just about where the airport was. I looked around for any evidence of it which might have remained, but couldn't find any." The location of Russell Field, as seen in a 2001 USGS aerial photo. 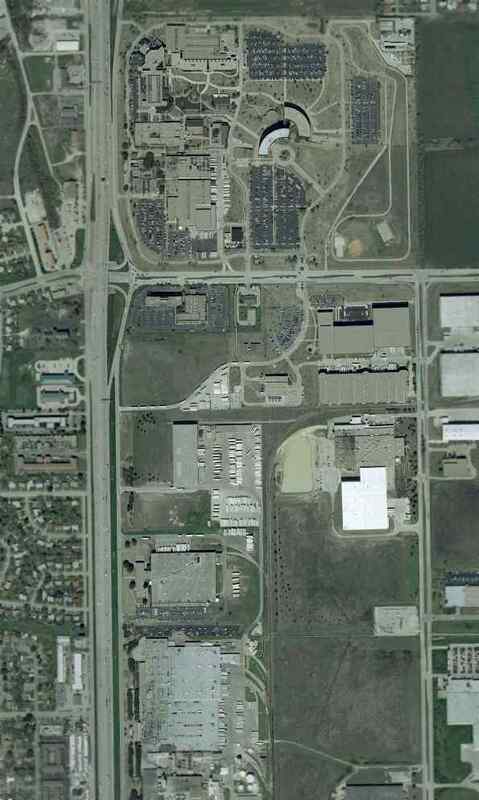 and then beyond that is the large Miller Beer brewery & distribution center. The highway visible [on the right] is Interstate 35." In October 2004, Tim Tyler stayed in the Holiday Inn which occupies part of the site of the former Russell Field. "Unfortunately, I didn't notice any signatures whatsoever of the site having once been an airfield." 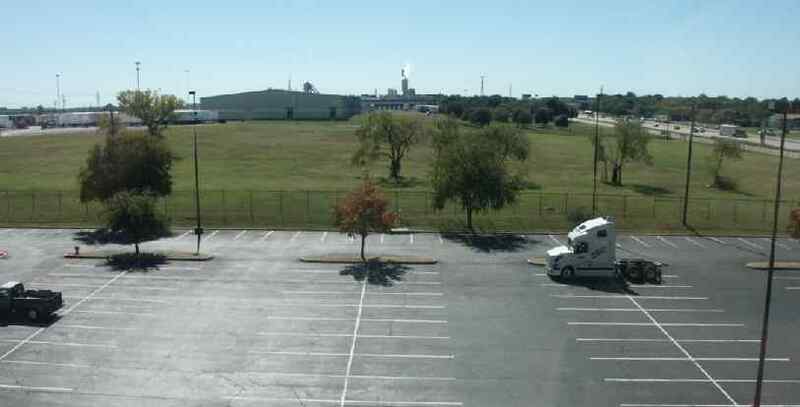 The site of Russell Field is located east of the intersection of Interstate 35 & Altamesa Boulevard. A 1918 aerial view looking north at Carruthers Field (courtesy of Benbrook Public Library, via Bill Morris). the Aviation Section of the U.S. Army Signal Corps consisted of 5 'combat' squadrons with 55 serviceable airplanes. Three of the squadrons were stationed in the Philippines, Hawaii, and the Panama Canal Zone. and enough ground support personnel to organize 10 squadrons for the U.S. Army Air Service. and by July, RFC Canada inspected 5 potential sites in Texas & Louisiana for use during the winter. Everman, and Benbrook based on their locations. In September 1917, the Army initially named the fields Jarvis (Hicks), Edwards (Everman), and Taliaferro (Benbrook). and designated them Taliaferro Field #1 (Hicks), Taliaferro Field #2 (Everman) and Taliaferro Field #3 (Benbrook). to handle pay, purchasing, and administrative services for their own personnel assigned at the three fields. Bill continued, “On 4/16/18, the fields were formally renamed Taliaferro Field (Hicks), Barron Field (Everman) and Carruthers Field (Benbrook). The 3 airfields around Fort Worth were part of a larger effort to increase pilot training for the US Army Air Service. Barron Field & Carruthers Field were 2 of the 14 newly-constructed fields for primary pilot training. who used the 3 Taliaferro Fields (from The Frontiers of Flight Museum, courtesy of Knox Bishop). A 12/3/17 drawing showing water mains, sewer mains, roads, and sidewalks as constructed at Taliaferro Field #3 (courtesy of Bill Morris). According to Bill Morris, “The field initially included 12 hangars & the hospital on the far right had 3 wings. to support primary pilot training; aerial gunnery; and pursuit, observation & bombardment training programs. Each field was laid out & constructed using a standard set of blueprints prepared by Albert Kahn, a Detroit architect. (from the Sgt C. P. Devos Collection, Deseronto Archives, Ontario, via Bill Morris). An undated aerial view of the hangars of Benbrook Field (from the Benbrook TX Public Library, via Corky Baird). An undated photo of a group in front of a DH-4 biplane & hangar at Benbrook Field (from the Benbrook TX Public Library, via Corky Baird). An undated aerial view of a formation of biplanes from Benbrook Field (from the Benbrook TX Public Library, via Corky Baird). when the Air Service briefly adopted the British & French roundel insignia to provide some type of uniform markings for allied aircraft. was already world renown as the famed dance team of Vernon & Irene Castle. Regrettably, he was killed in a plane crash at Benbrook on 2/15/18. The student pilot & Castle's pet monkey 'Jeffrey' survived the crash. believed that he deliberately crashed in order to avoid hitting another plane, and saved their lives. who sadly watched the flagged draped casket pass in downtown Fort Worth. Even today, there is a street in Benbrook named in his honor. 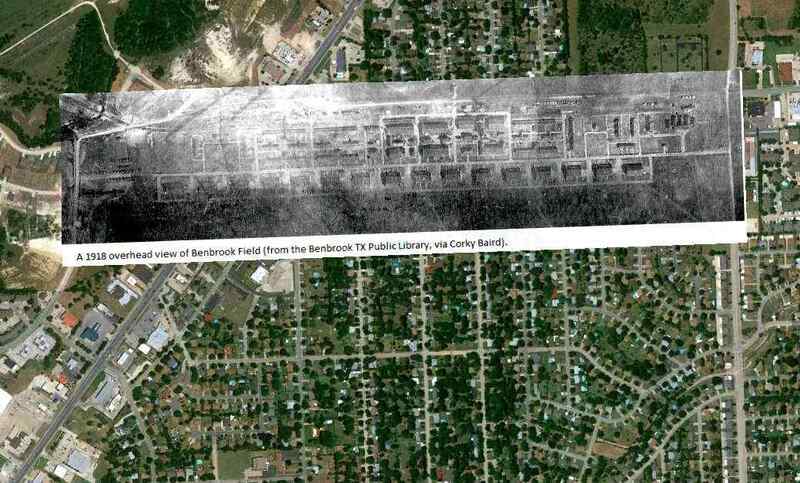 A 1918 overhead view of Benbrook Field (from the Benbrook TX Public Library, via Corky Baird). 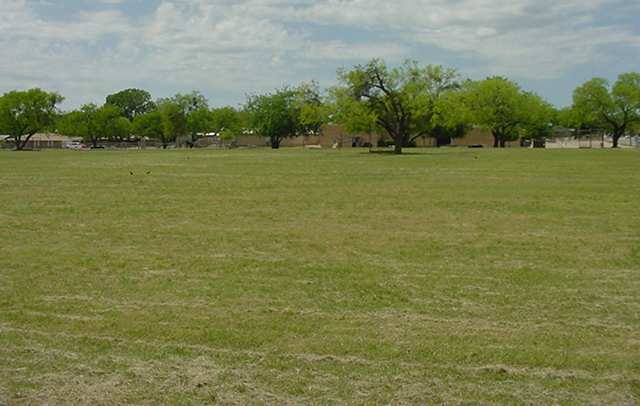 Benbrook Field consisted of a grass landing area alongside of which were arrayed an amazing total of 16 hangars. The buildings & hangars were oriented east/west on the north side of the flying field. 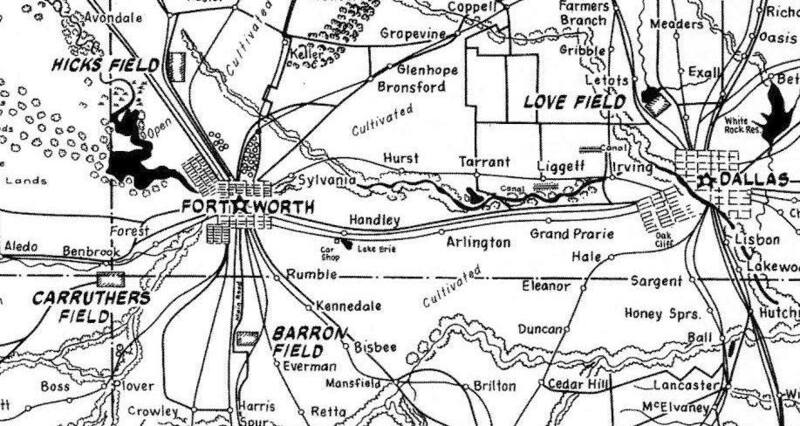 The RFCC used the 3 fields around Fort Worth from November 1917 – April 1918. 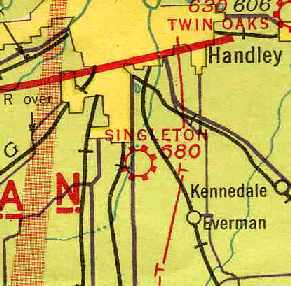 Benbrook was not depicted on the 1918 USGS topo map. 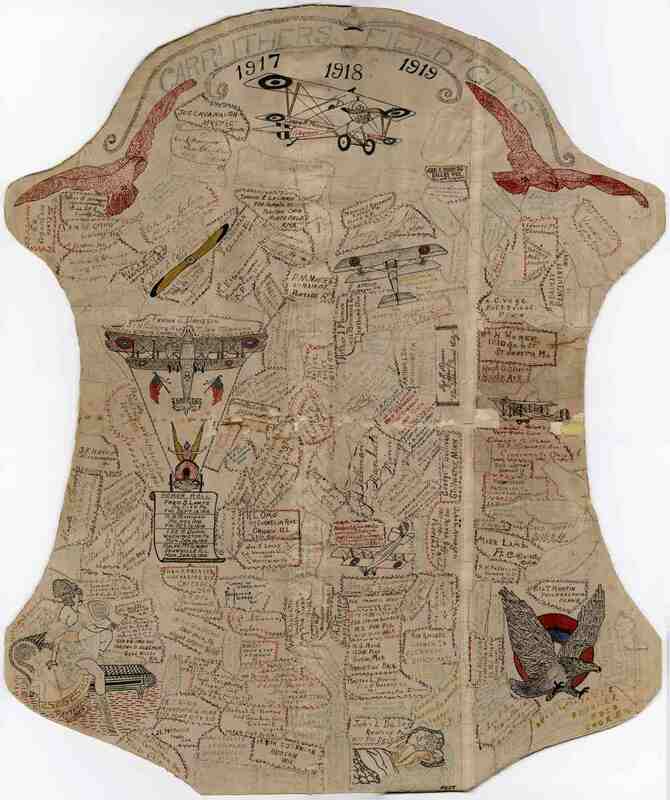 A photo (courtesy of Rose Wood) of what Steve Messenger reported is “a piece of biplane canvas, mounted on cardboard. [It] contains an ink drawing of an early airplane & names of the U.S. Army soldiers, including my Grandfather, Clare Messenger. The title reads: Carruthers Field Boys 1917 1918 1919.
and was sold at auction to William Monnig, President of the Fort Worth Chamber of Commerce, in January 1920 for $43,500. A 1920 Agriculture Department Soil Map depicted “Carruthers Field (Aviation)” (courtesy of Randy Gilbert). 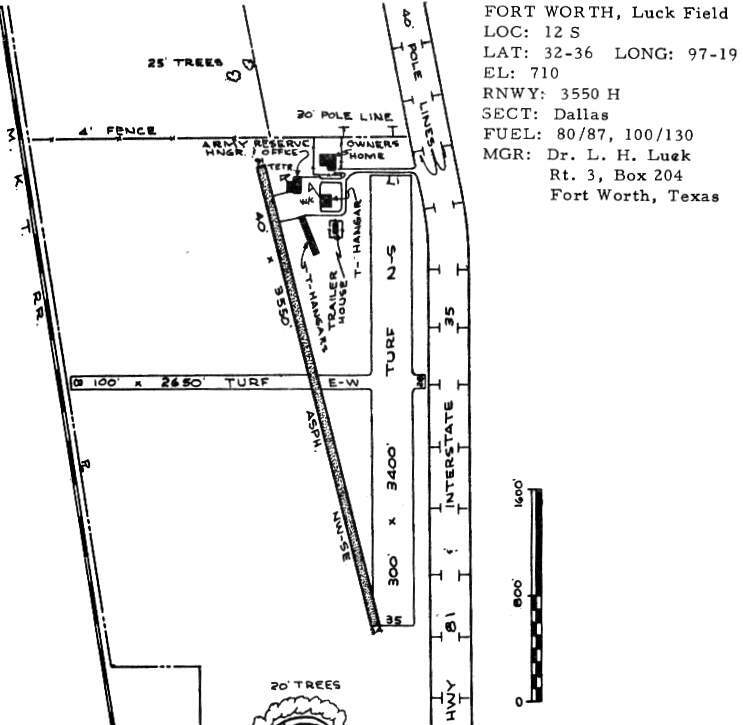 By 1932, Benbrook Field was no longer depicted at all on the Dallas Sectional Chart. Benbrook was evidently was not reused during WW2. It was not depicted on the 1945 USGS topo map. 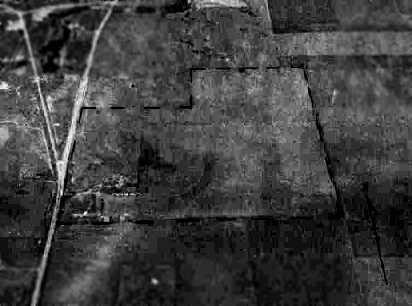 The 1918 Carruthers Field aerial photo overlaid by Bill Morris on a 1952 USGS aerial photo. 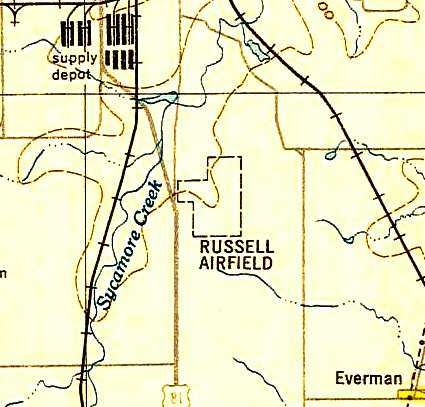 Bill observed, “The [blue] line shows the location of the railroad spur which connected the field to the T&P Railroad. Some of the building & hangar foundations were still visible on the 1952 photo. 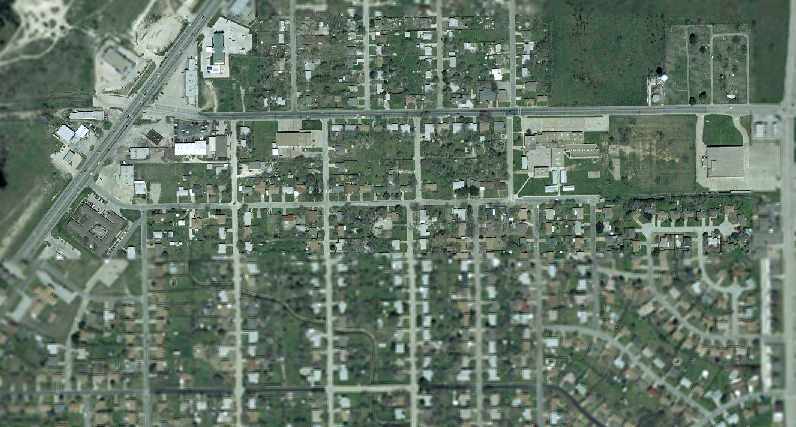 The road on the right is Winscott Road & the diagonal highway is US 377.
which had been mostly redeveloped with housing. However, John Wilson recalled, “I moved to a brand new house at 1010 Usher Street in 1956. I lived there until 1964. 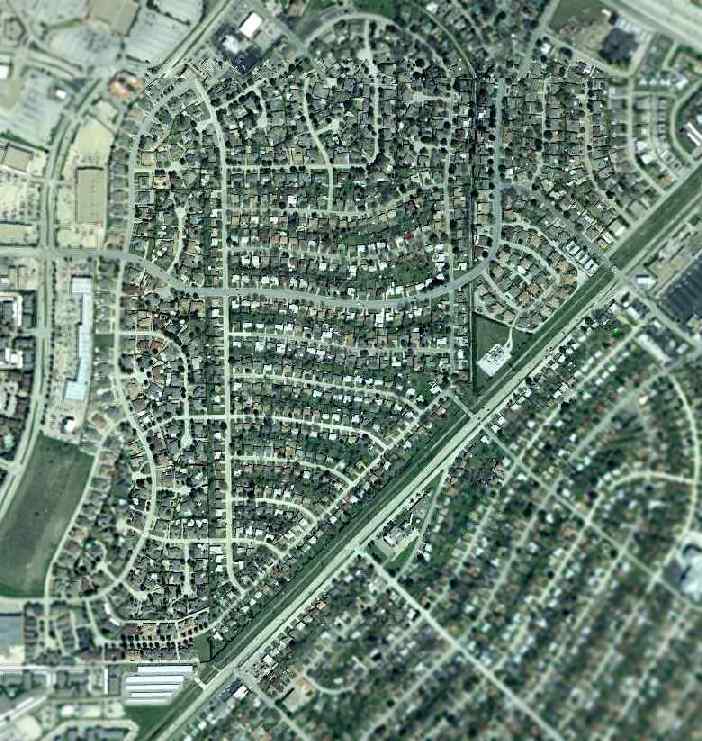 As a child there, my siblings & I explored almost every square inch of the Benbrook area. We had found & identified ruins of some of the structures used by the airfield without knowing exactly what they were. generally in one corner of the building for water & sewer lines. 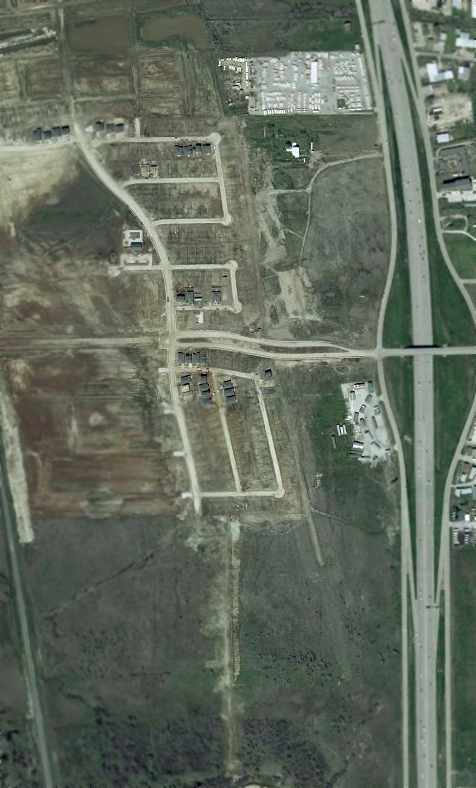 As seen in the 2002 USGS aerial view, the site of Benbrook Field has been mostly redeveloped with housing. A 2003 photo by Scott Murdock of the memorial to the fliers of Benbrook Field. A 2003 photo by Scott Murdock looking west across the area formerly occupied by hangars at Benbrook Field. Bill Morris observed, “This is a photo of the school yard at Benbrook Elementary School. you can see a large concrete apron which the owner uses a patio. I was told this was where one of the hangar buildings was located. there is a memorial plaque which describes the airfield." and Cozby North Street on the south. The hangars were located on the south side of Cozby North Street. David Martin reported in 2004, "I live about 200-300 yards west of the eastern edge of what was the field. in a very few back yards along Cosby North Street here. I have seen them. 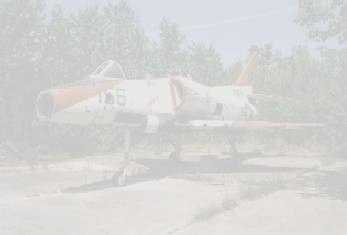 Homeowners in that area say that they have been told those are remnants of the old airfield. a thing which I guess is a possible cistern from the field. (although as a police officer here in Benbrook I can not say people should go out there as it is trespassing). I have been out to that building several times as we have used it for tactical training. and seems to be of the same construction as the one remaining building at Barron Field. The walls of both buildings are extremely thick." 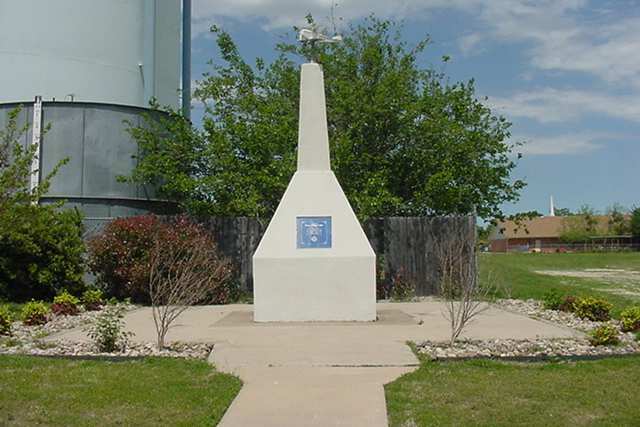 David continued, "The memorial at Benbrook Field is for the famous dancer Vernon Castle [who died in a crash at Benbrook]. as his service project a few years ago. in the extreme southwest corner of the flying field. The 1918 photo of Beenbrook Field overlaid by John Wilson over a 6/12/11 aerial view. extending from just west of Route 377 eastward to the intersection of Winscott Road. to make room for a Wal-Mart Super Center. See also: The Handbook of TX Online. 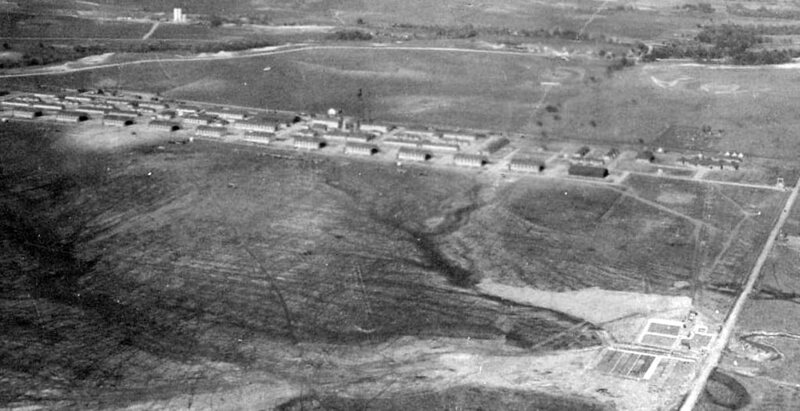 An aerial view looking southwest at Barron Field, probably late 1917 or early 1918 due to the number of tents on the site (courtesy of Bill Morris). which were used by the U.S. Army Air Service to conduct flight training during the First World War (the other 2 fields were Taliaferro Field & and Carruthers Field). while the RFC Canada was here - the RFC was in charge of the flying training program. On 4/16/18 the facility was renamed Barron Field for Cadet Robert Barron, who was killed at Chandler Field in Pennsylvania on 8/22/17. and housed as many as 150 officers & and 900 enlisted men at the time of the Armistice in November 1918.
and continued to train RFC & American cadets & support personnel who had started training in Canada before moving to Texas for the winter. Additional American cadets were added to the training program while they were at Taliaferro Field #2. Number 42 Wing consisted of the 78th, 79th, 80th, 81st, and 82nd Canadian Training Squadrons. A 1918 aerial view of Barron Field (courtesy of Bill Leary) showing an amazing lineup of no less than 17 hangars. A 1918 aerial photo mosaic of Barron Field (courtesy of Bill Morris). A 1/5/18 property map prepared by the Supply Division of the U.S. Army Signal Corps (courtesy of Bill Morris) shows the extent of the land area of the field. Flying Cadet Franklin Fairchild was killed in a February 23, 1918 crash of his airplane at "Taliaferro Field #2, Everman". According to Bill Morris, “Between November 1917 - April 1918, 6 RFC personnel died at Barron Field due to aircraft accidents & other causes. Thirty three U.S. Army Air Service personnel died at Barron Field between November 1917 - July 1919 when flying operations ceased. 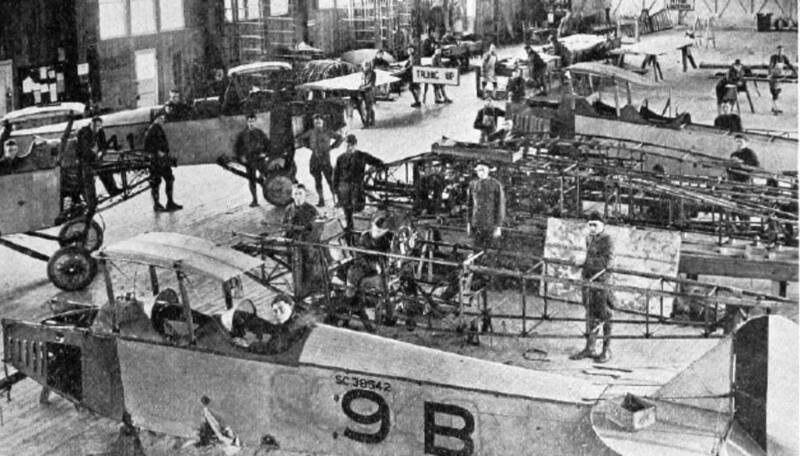 A circa late 1918 photo of the Barron field aero repair shop (courtesy of Bill Morris). Barron Field was not depicted on the 1918 USGS topo map. 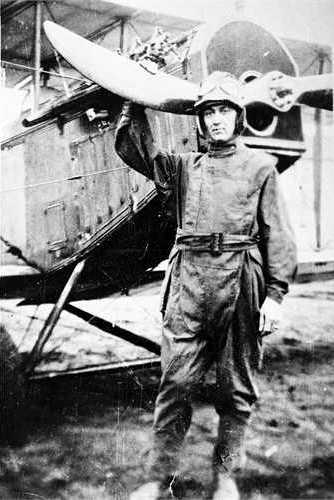 An undated (circa 1918-19) photo of Walter Wiley in front of a JN-4 Jenny at Barron Field (courtesy of Mike Cole). Mike Cole reported, “My Great-Great Uncle's discharge papers dated 3/27/19, shows he was discharged at Barron Field, Everman, TX. 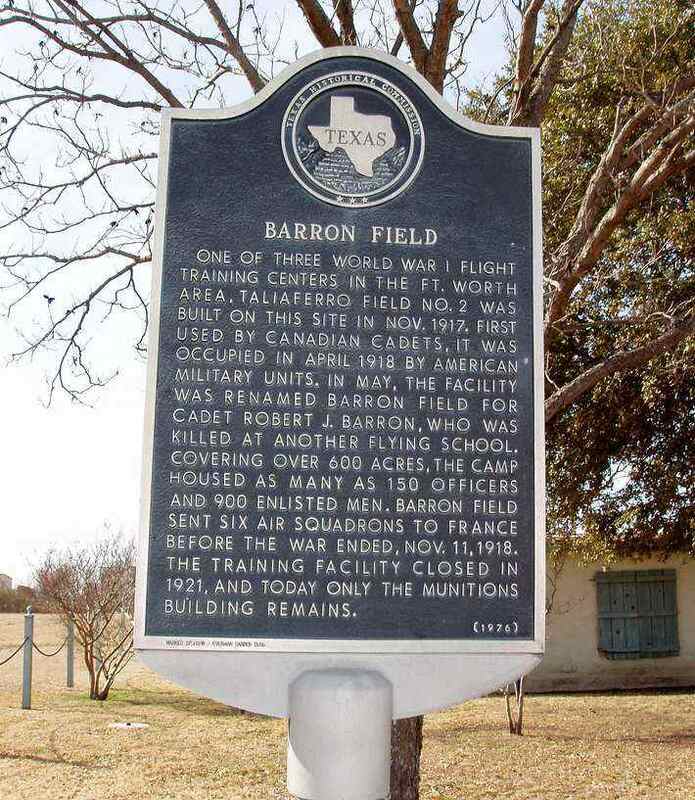 According to Bill Moris, “In late 1919 Barron Field went into 'caretaker status' & was used as a site for disposal of Air Service equipment, including surplus Curtiss JN-4s. 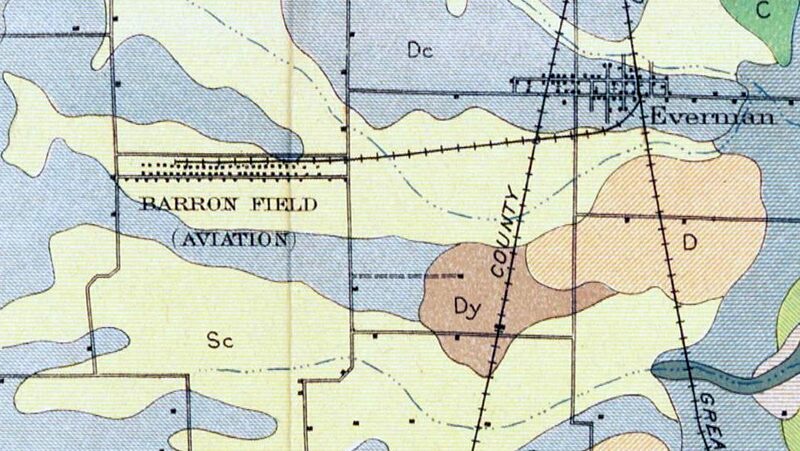 A 1920 Agriculture Department Soil Map depicted “Barron Field (Aviation)” (courtesy of Randy Gilbert). but when Fort Worth failed to make the necessary upgrades, the site was dropped in 1924. The Barron Field property reverted to farm land. 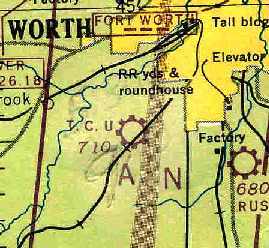 By 1932, Barron Field was no longer depicted at all on the Dallas Sectional Chart. Barron was evidently was not reused during WW2. 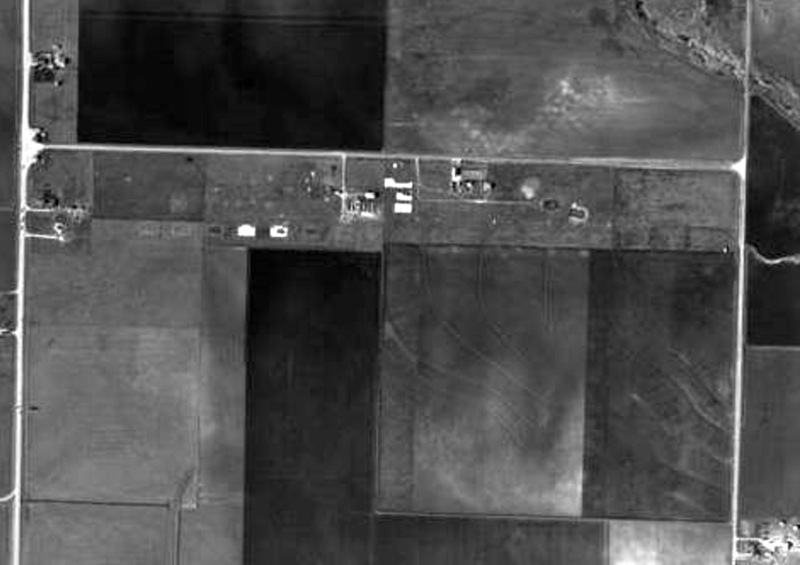 A 1952 aerial photo of the Barron Field site (courtesy of Bill Morris). Bill Morris observed, “The 3 white shapes in the center of the photo were the cement floors of the garage, aircraft engine test facility, and the machine shop. The foundation of the aero repair building is discernible to the west of the machine shop, just below the small house/building. Foundation outlines of most of the hangars are visible & 2 still have their cement floors largely intact. The remains of the sewage treatment ponds are visible on the right. 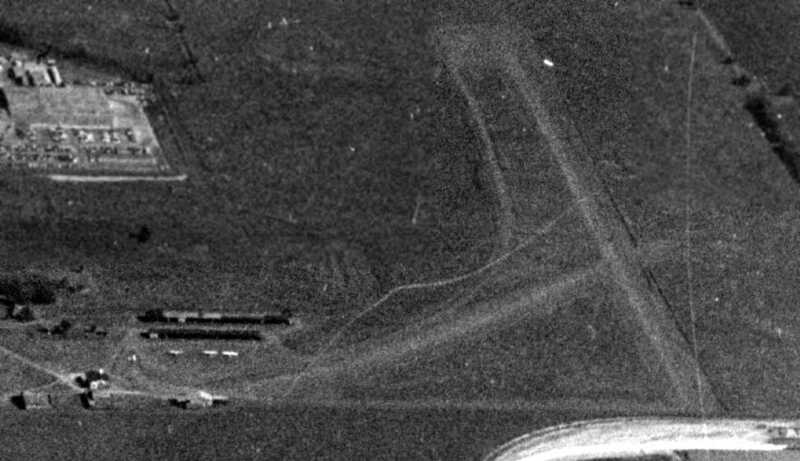 A 1956 aerial photo showed the remains of the foundations of several of the row of Barron Field hangars. 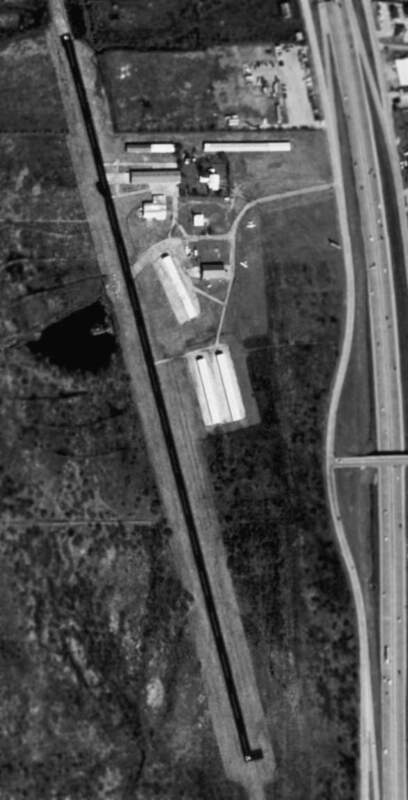 A 1963 aerial photo showed that several buildings had covered the western portion of the remains of the row of Barron Field hangars. A 1970 aerial photo showed no significant change at the site of Barron Field. but remains of the middle portion of the hangar foundations were still recognizable. A 1990 aerial view no longer showed any trace of the remains of the Barron Field hangar foundations. A circa 2000 aerial view of the northeast corner of the Barron Field site. 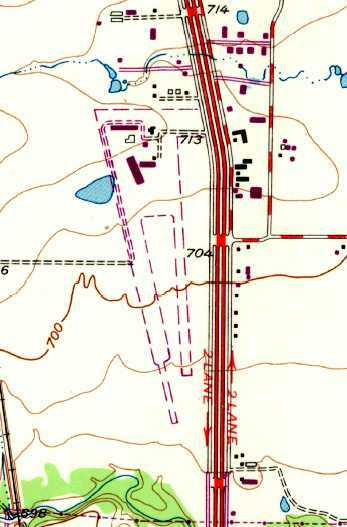 Bill Morris observed, “The small building near the upper right corner, just to the left of the road, was the munitions building and was located on the eastern edge of the field property. 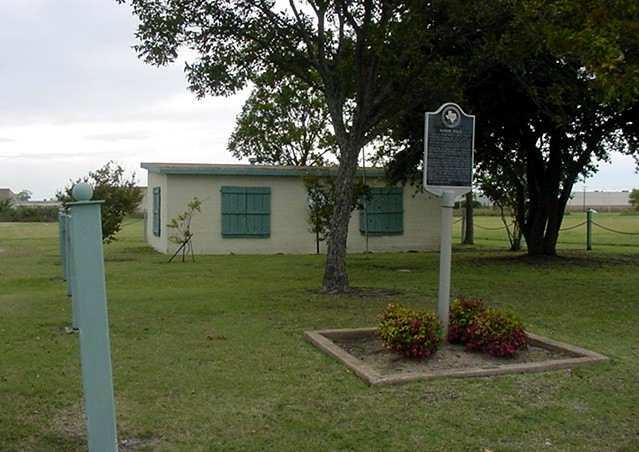 A 2003 photo by Scott Murdock of the historical marker & sole remaining building at Barron Field. which explains what activities were engaged in at that airfield during WW1. one would never know there was once a flying field there." and we strongly believe it was the munitions building for that field. The walls of both buildings [at Barron Field & Carruthers Field] are extremely thick. and the district was talking about making it into a small museum for their students. I don't know where that project stands or if the district followed through or not." A 1/25/10 photo of the historical marker placed in 1976 at the site of Barron Field. machine shop, blacksmith shop, and the aero & quartermaster supply buildings. The site of Barron Field is located from present-day Interstate 35W on the west to Oak Grove Road on the east. 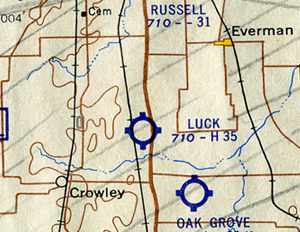 Luck Field, as depicted on the July 1963 DFW Local Aeronautical Chart (courtesy of Ken Morris). This general aviation airfield was apparently built at some point before 1956.
and he had a beautiful home on the field. Mr. Bill Knight ran the flight school & repair shop there. Mr. Knight had a partner in a few planes. His name was Mr. Guftafson. 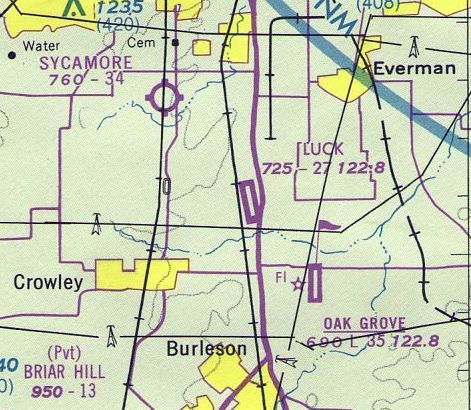 Luck Field was not yet depicted on the 1955 USGS topo map nor the September 1957 Dallas Sectional Chart (courtesy of Chris Kennedy). along with some additional buildings/hangars. was on the July 1963 DFW Local Aeronautical Chart (courtesy of Ken Morris). It depicted Luck as having a 3,500' hard-surface runway. as well as 2 turf runways: 3,400' Runway 17/35 & 2,650' Runway 8/26. A total of 4 hangars were clustered northeast of the runway. The field apparently also had some military use, as one building is labeled "Army Reserve Hangar & Office". The manager was listed as Dr. L.H. Luck. The earliest topo map depiction which has been located of Luck Field was on the 1968 USGS topo map. Curiously, the field was not labeled at all, even though it depiction 2 unpaved runways & several buildings on the northwest side. The earliest photo that has been located of Luck Field was a 1970 aerial view. It depicted the field as having 1 paved northwest/southeast runway & 1 unpaved north/south runway. The previous east/west runway appeared to have been abandoned. A total of 7 aircraft were visible around the hangars on the northeast side of the field. the runways at Luck Field had started to shrink. and the former turf Runway 8/26 had been closed. showed the field to have one paved runway & one grass runway, with several hangars at the north end. which depicted Luck as having a 2,700' paved runway. 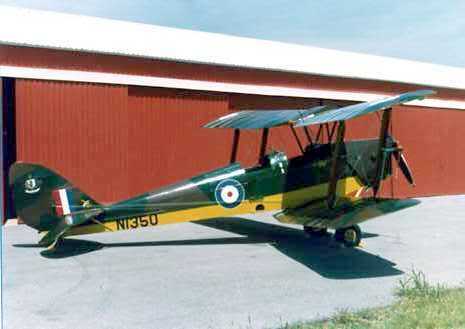 A 1979 photo of a vintage Tiger Moth biplane in front of a Luck Field hangar. 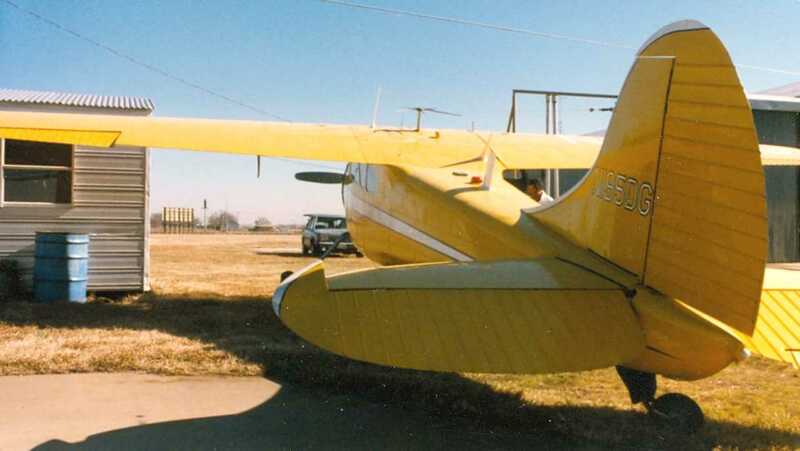 A 1980 photo of a 1950 Cessna 195 at Luck Field. described the runway configuration of Luck Field in basically the same manner. the number of hangars had increased to eight. and the operator was listed as Executive Aviation Inc., which provided flight instruction. Roger Mullins recalled of Luck Field, “I soloed there in 1992 & earned my private license also in 1992.
a chap from Holland that came to the U.S. to learn to fly, build time, and whose goal was to fly for KLM. James McKeown recalled, “Luck Field... I remember seeing a handful of aircraft out there, and the landing strip was regularly used. with several 10 gallon gas cans (usually Friday or Saturday afternoons), and filled the cans up. (probably because he knew then the airport was in a downhill direction operationally & would eventually close, or just didn't flat out care). Luck Field was still operating, and it appeared as if the primary runway had recently been repaved. The grass runway was no longer apparent. "Luck Field closed within a few years after Leske Luck (its owner) died." According to Roger Mullins, “Luck was closed in the mid- to late 1990s. The increasing value of the property most likely played a large role in the closure of Luck Field. Sycamore Strip to the north, Luck Field, and Oak Grove (later to become Spinks) to the south. particularly once the local government replaced Oak Grove Airport with the new Spinks Airport. with a new housing development being built over it. Remnants of a portion of the south end of the runway were still visible. An August 2002 aerial view by Paul Freeman looking southeast at the site of the former Luck Field. An August 2002 photo by Paul Freeman of what used to be the entrance to Luck Field, with the former airport owner's home on the right. To the casual observer, there was no indication that an airport once stood at the site. all of the hangars had been removed. with a wall surrounding the development that roughly paralleled the former runway. Garden Acres Drive had been extended, and crossed over the location of the former runway. which formerly surrounded the southern set of hangars at the former Luck Field. The site of Luck Field is located west of the intersection of Interstate 35 & Garden Acres Drive.